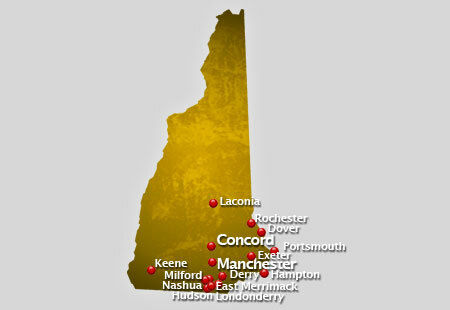 AirSign provides extensive aerial advertising coverage throughout all areas of New Hampshire. From beach aerial advertising to sporting events and over busy highways, we'll display your message to crowds in a way your audience will be certain to remember. The state of New Hampshire is home to the admired landmark of the state, The Old Man of the Mountain or the Great Stone Face or The Profile in the White Mountains. It is a series of five granite cliff edges of Cannon Mountain. New Hampshire has a total land area of 9,350 square miles and ranked 46th among the largest states of America. It is bordered by the states of Maine and Atlanic Ocean in the east, Massachusetts in the south, Vermont in the west and the Canadian Province, Quebec, in the north. The state has a humid continental climate with warm and humid summers accompanied by thunderstorms and cold winters accompanied by snowfall. Other places of interest in New Hampshire are the Lake Winnipesaukee, which is the largest among 1,300 lakes and pands of the state, the restored Strawberry Banke, an outdoor museum, Daniel Webster birthplace near Franklin and the White Mountain National Forest, a 724,000-acre land. There are about 150 public high schools in New Hampshire and at least 30 private own high schools. Between 1827 and 1830, the first high schools established in the state are the Boys high school and the Girls high school in Portsmouth. In a much higher education, some of the popular universities are the Community College System of New Hampshire, University System of New Hampshire and the Thomas More College of Liberal Arts. Among these universities sprouts some of the professional sports league teams such as the Manchester Wolves of the Arena Football, New Hampshire Phanthoms of the Minor League Soccer and the American Defenders of New Hampshire of the Minor League Baseball. Crowds are an aerial advertiser's paradise! A typical flight over popular events or locations can result in as many as 8,000,000 impressions! Have us fly your aerial banner over the crowds in New Hampshire to put your message wherever you want, whenever you wish at the best value in mass marketing! The banner makes my TV and print media more effective. It seems to add the excitement effect back into the car business. Thanks for all your help. Copyrights © 2019 All Rights Reserved by AirSign Inc.